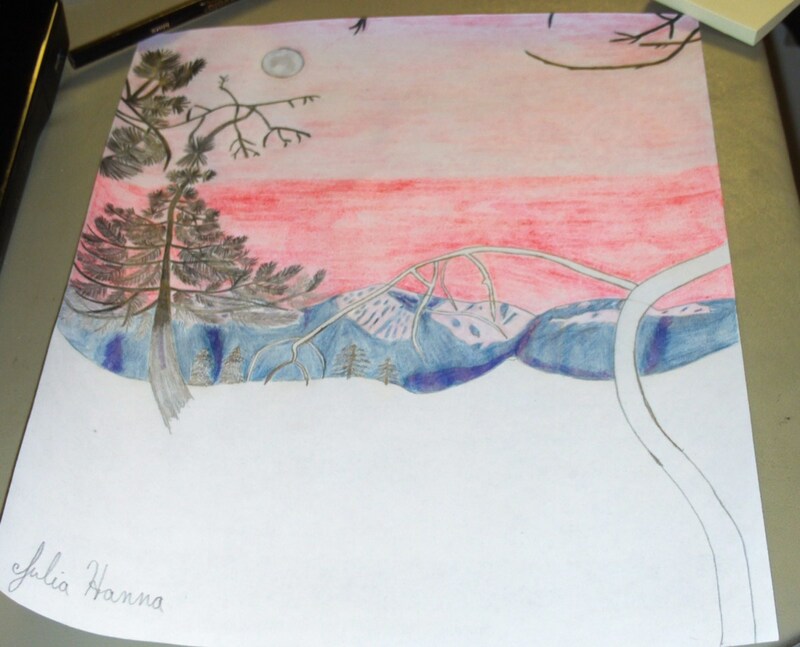 Drawing a picture of a forest scene at sunset is a stimulating art project for people who enjoy creating landscapes. 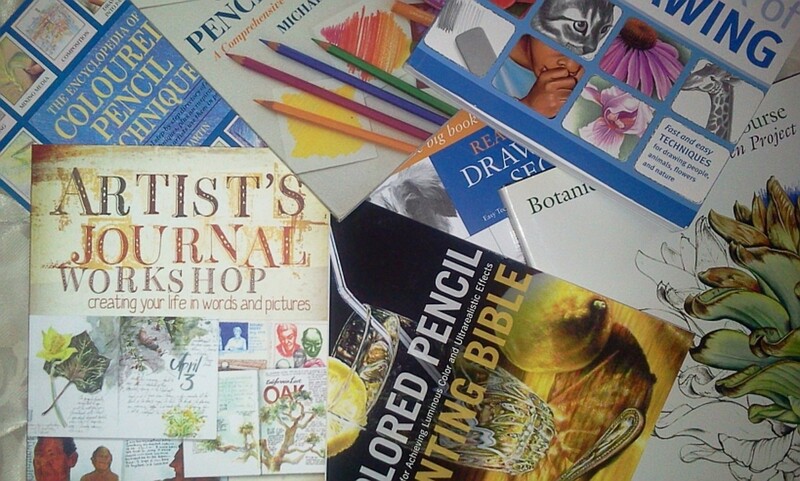 I love to draw because in our modern world it is the one thing we can still do without a machine. Yes, I used a camera and a scanner to share what my illustration looks like on this hub, but the drawing itself was created with my very own hands. This sunset sketch drawing was created by using several photographs I took of the view of Mount Baldy from the San Bernardino Mountains, and by using my own artistic license to create a sunset with a moon in the sky. 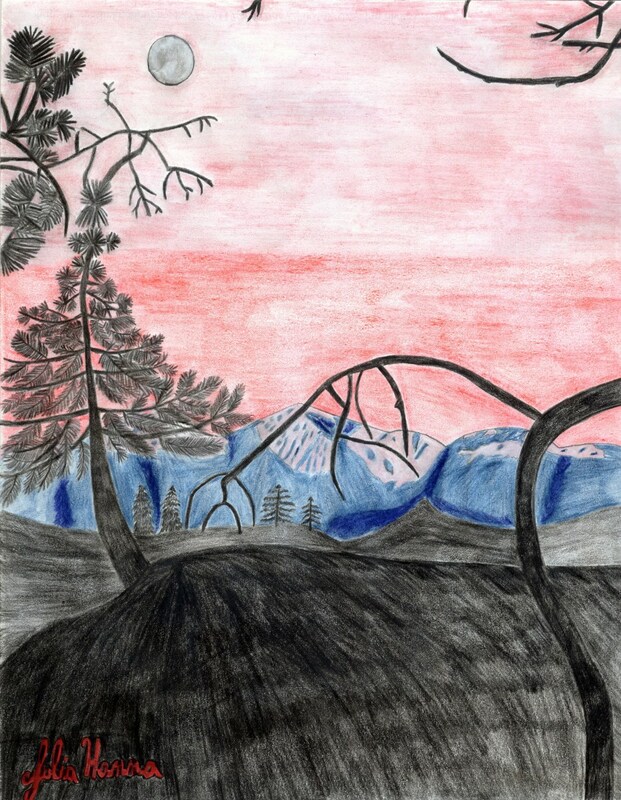 Usually the full moon is never above Mount Baldy at sunset (the moon is visible in the early morning), but for this drawing I decided to make it this way. The beauty/creativity of artwork is that you can do anything you want under the sun, even if that includes drawing a sunset! The scanned version of my completed sunset drawing. This picture taken in the early morning served as the inspiration for my drawing. Although the above picture was taken in the early morning, it served as the inspiration for my sketch because I liked the location of the moon in the sky. 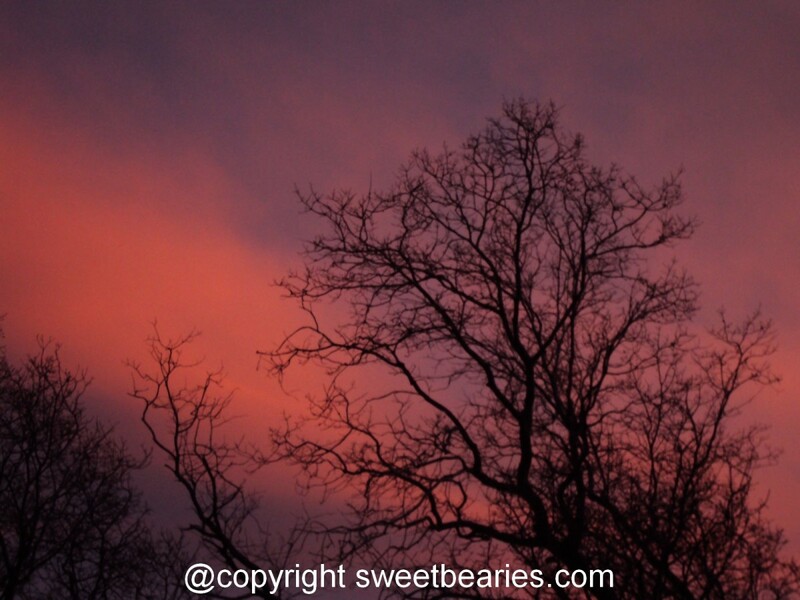 Below are a few of the sunset photographs I also used as ideas for designing my forest sunset drawing. 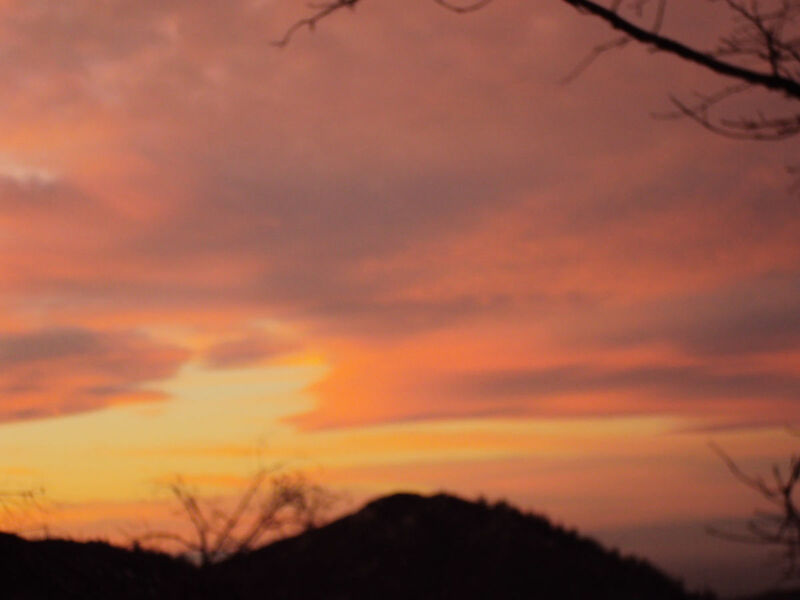 Sunset in the San Bernardino Mountains. 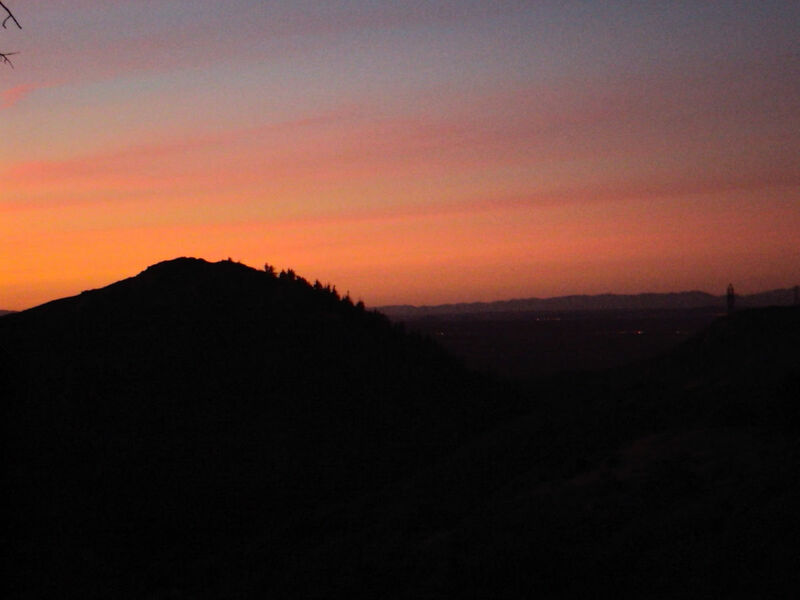 Sunset photograph of Mount Baldy. 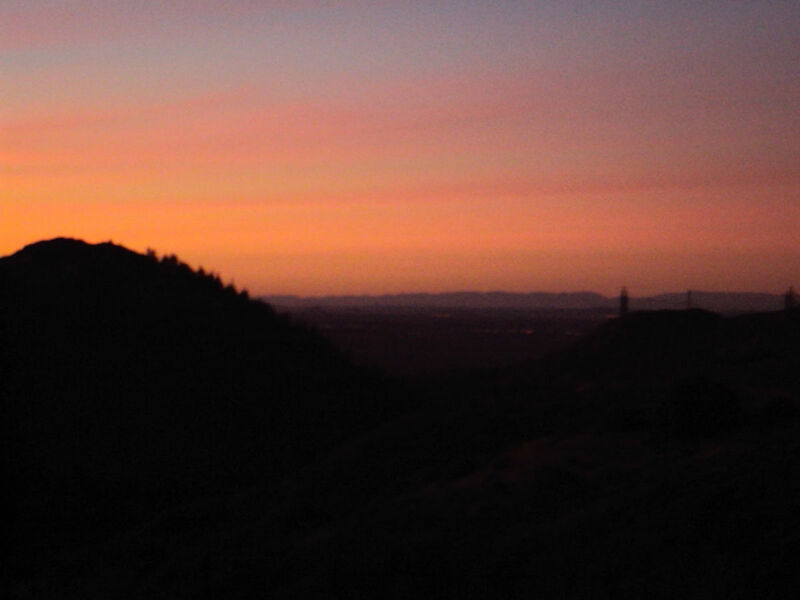 Another sunset view of Hesperia in the distance. The colors of this sunset were inspiration for my drawing. 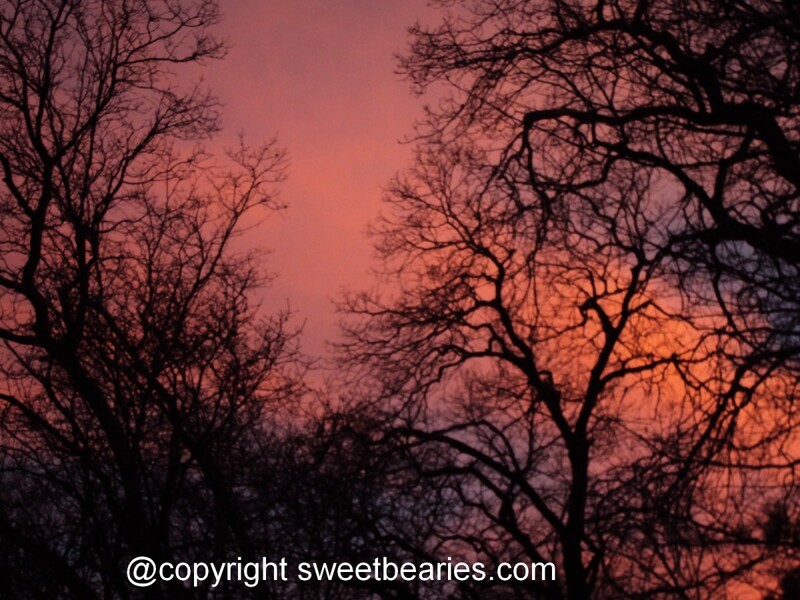 The textures of the trees in this sunset photograph were also of inspiration. 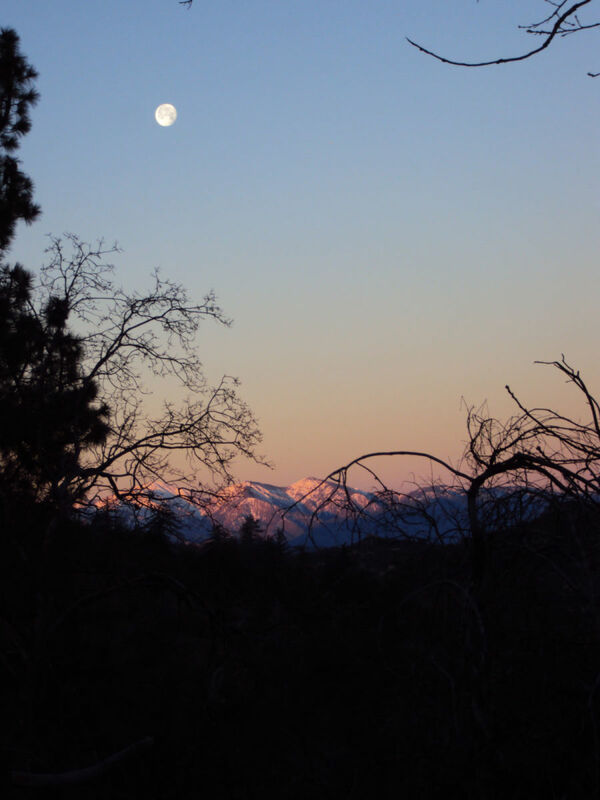 Another San Bernardino Mountains sunset photograph that inspired my drawing. 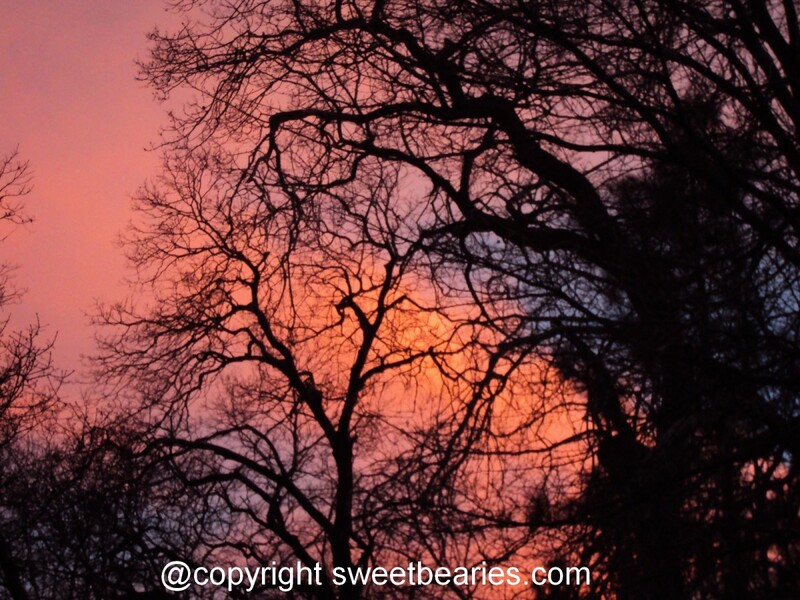 Sunset photographs with the black silhouettes of trees have inspired many of my drawings. 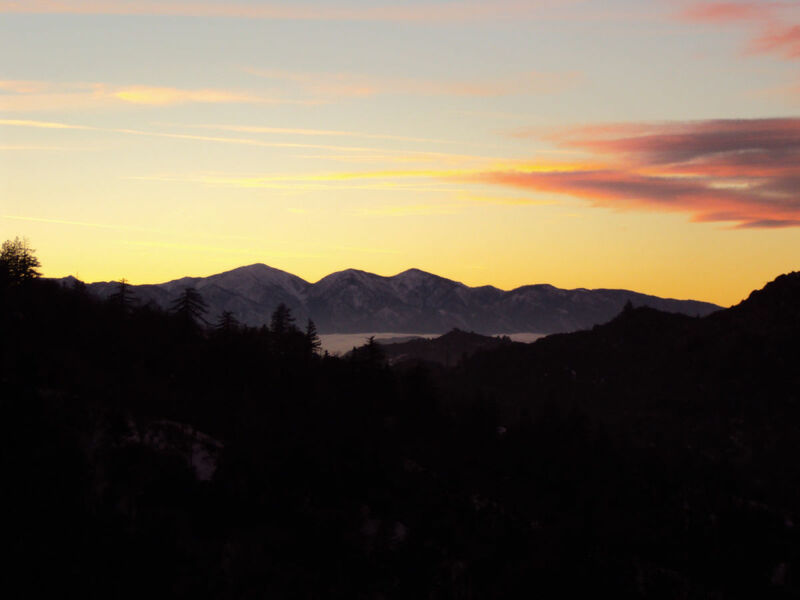 By gathering together a few sunset photographs I took up in the San Bernardino Mountains, I was able to design a sketch to my liking. 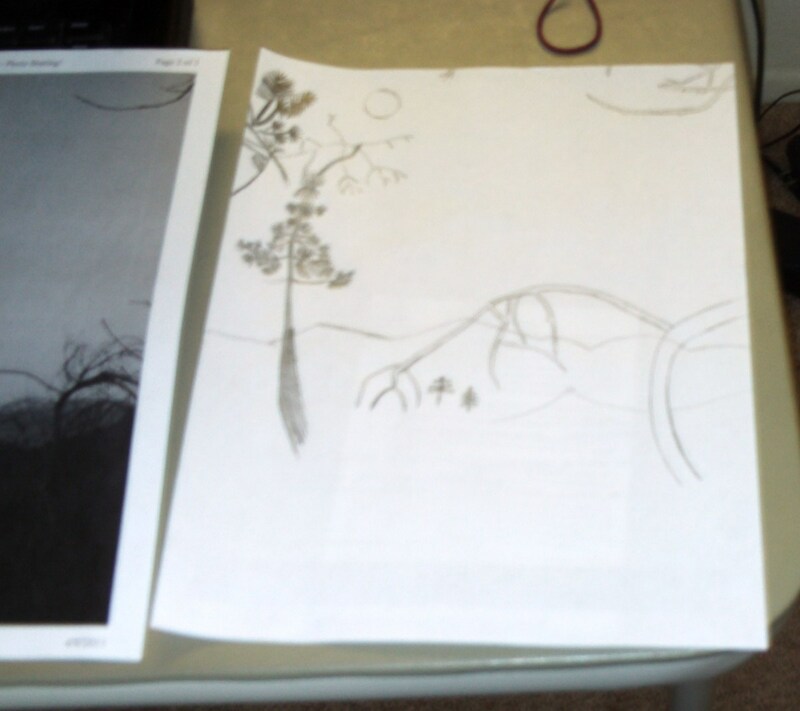 Here I used a print-out of a reference photograph as I sketched the forest scene. Using a print-out of a reference photograph for sketching can be more convenient than using photos on the computer for actual reference. However, I also like to refer to pictures on the computer because I have the ability to zoom in to see details, and in the past I used a magnifying glass to do that. 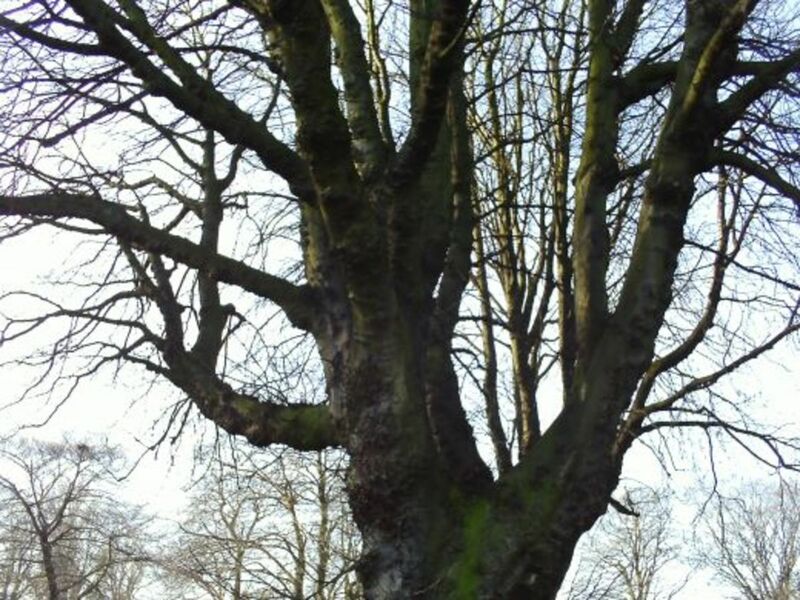 Here I am adding more details to the drawing of my tree. 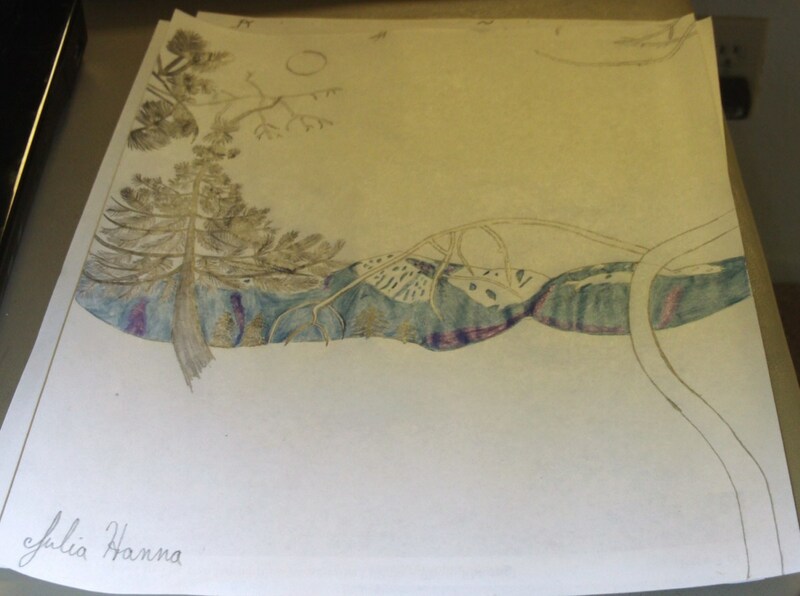 In this phase of the sketch I am added more detail to the trees as I continued to draw the forest scene. I use a violet-blue colored pencil to begin shading in the peaks of Mount Baldy. For this art project I used a violet-blue colored pencils to begin shading in the peaks of Mount Baldy. The tops of the peaks remained white in patches to mimic the snow that is on these mountains. 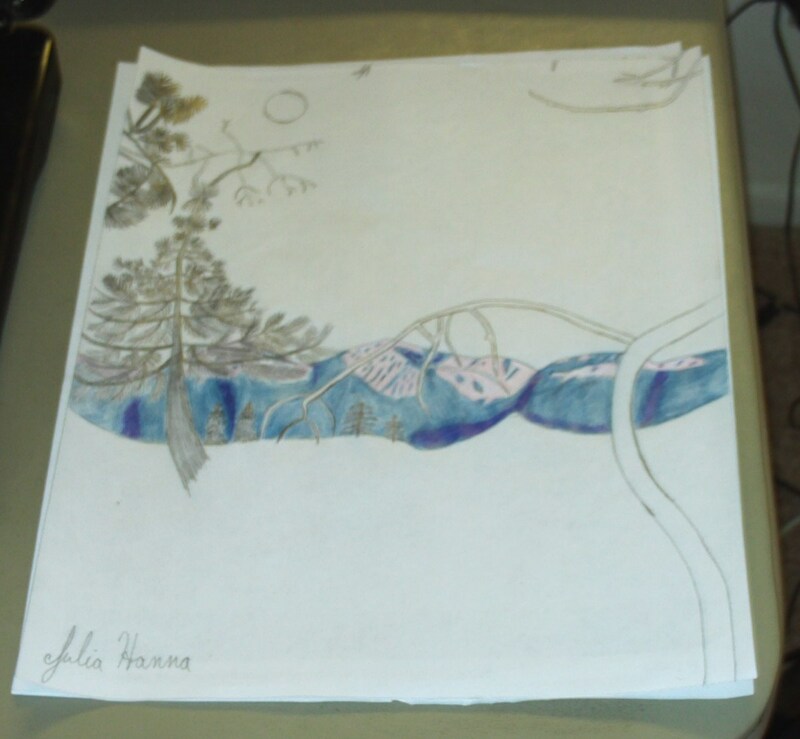 The mountains are now completely shaded in with the violet-blue colored pencil. I used the violet-blue colored pencil to finish coloring in all the areas of Mount Baldy that were not covered in snow. Here I added darker blue shadows to Mount Baldy to give it more depth. 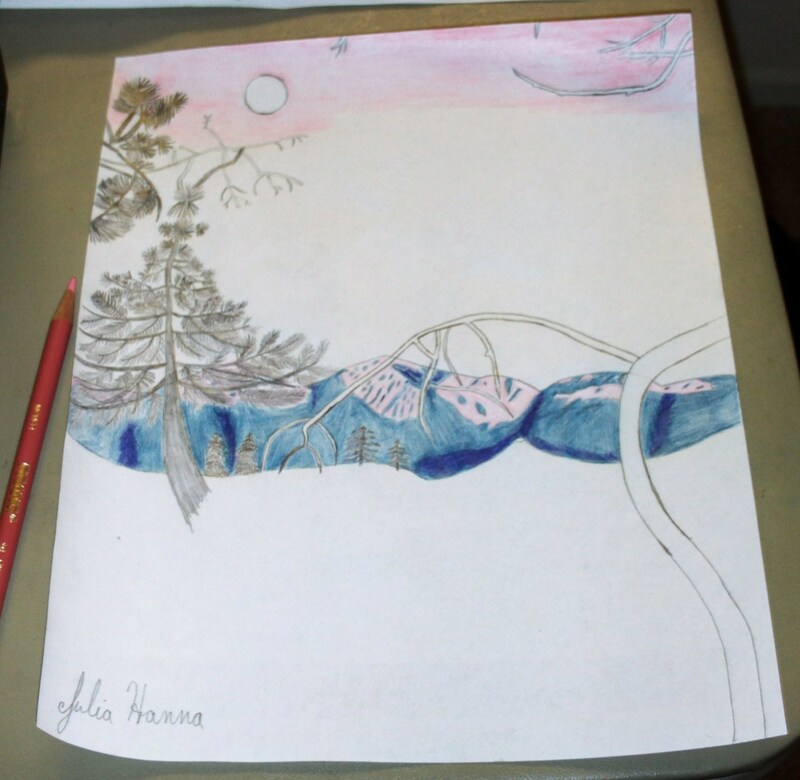 Using the darker blue colored pencil helped to give the mountains a bit more depth, mimicking the shadows of sunset. 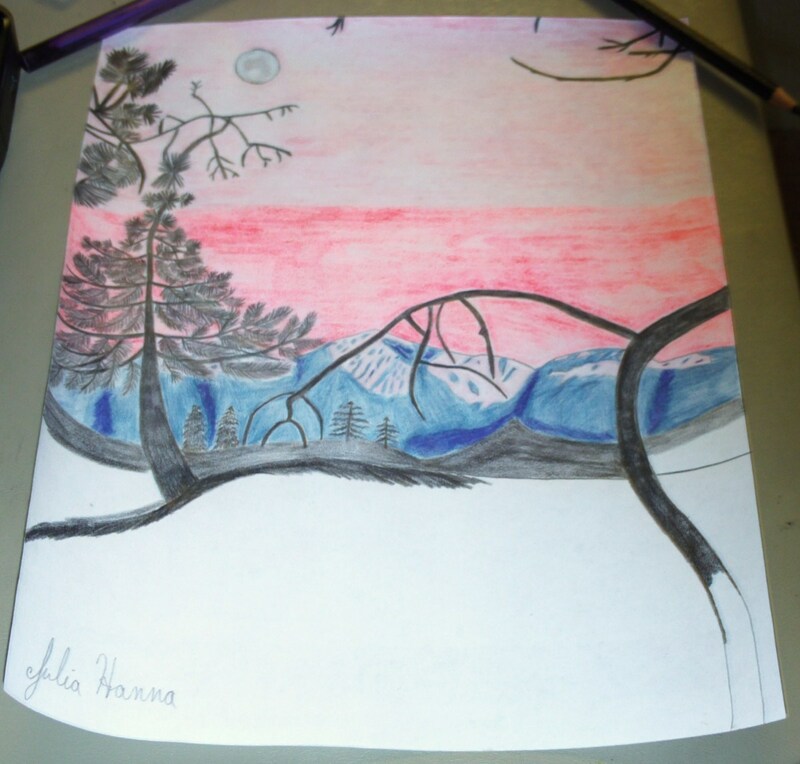 Used a light pink colored pencil to add a slight reflection of the sunset on the snow. 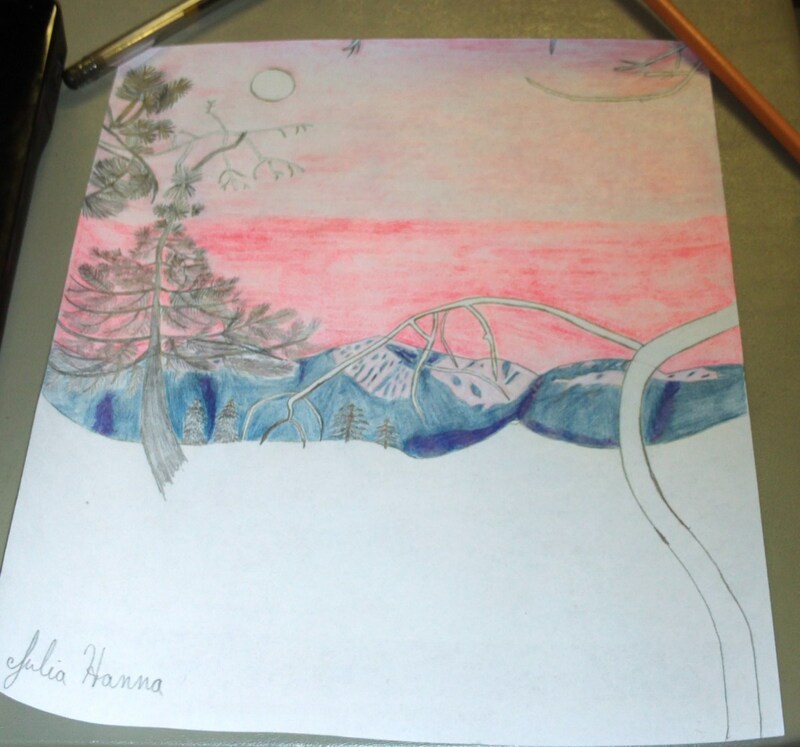 I used a light pink colored pencil on the snow portions of Mount Baldy to make it look like the sunset is reflecting off of it. In this phase of the sketch I am adding the light pink color to the sky. The sunset sketch really begins to come together when I started to add the light pink color to the top of the sky. Here I finished coloring in the sunset portion of the sky. 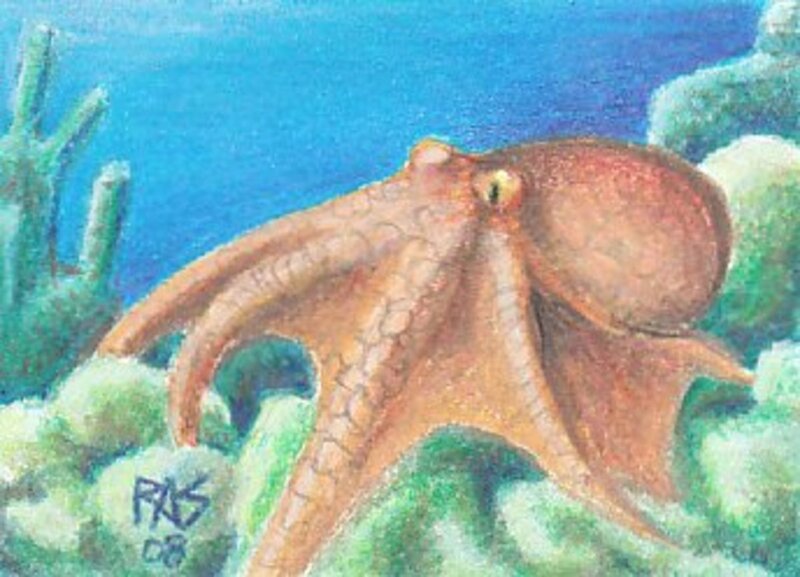 Here I used a bright pink colored pencil to shade in the bottom part of the sky. The light pink and the dark pink color blends together to create a striking sunset in this sketch. 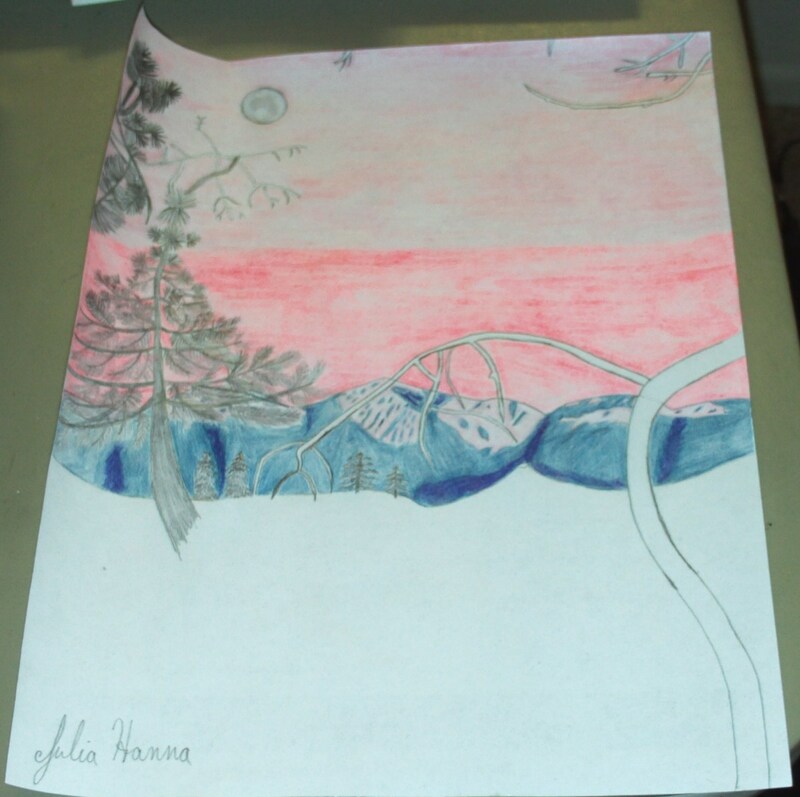 I used a two shades of gray colored pencils to create the moon in my sunset scene. 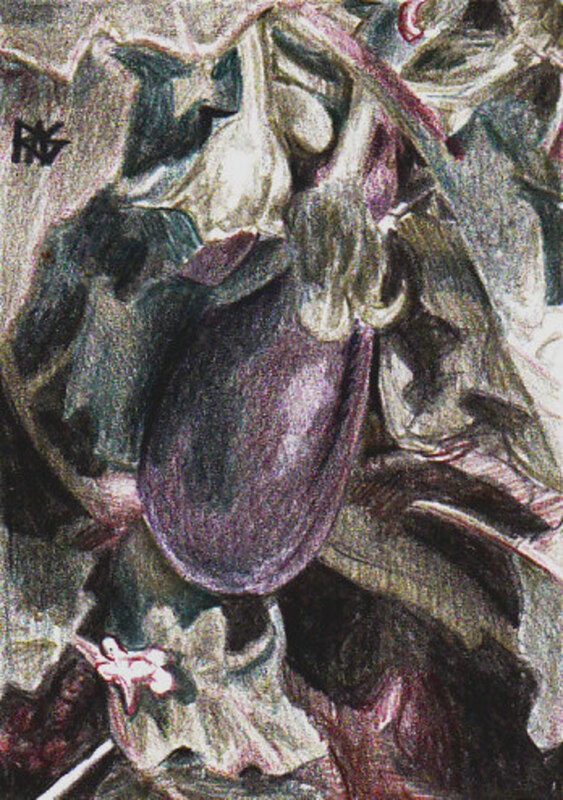 In this phase of the sketch I used two shades of gray colored pencils to fill in the moon. 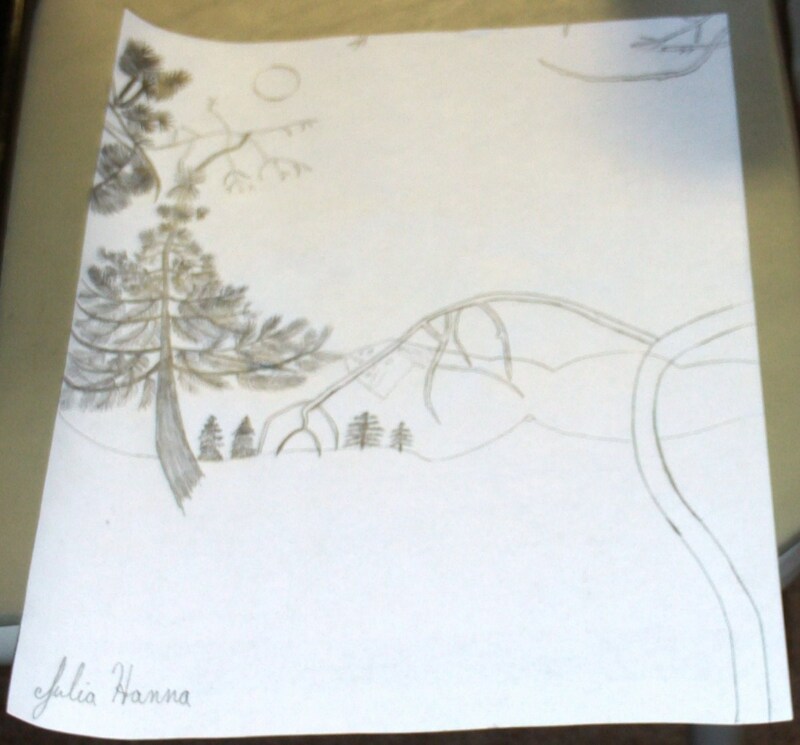 Here I am beginning to fill in the silhouette of the pine trees and the mountains with a black colored pencil. 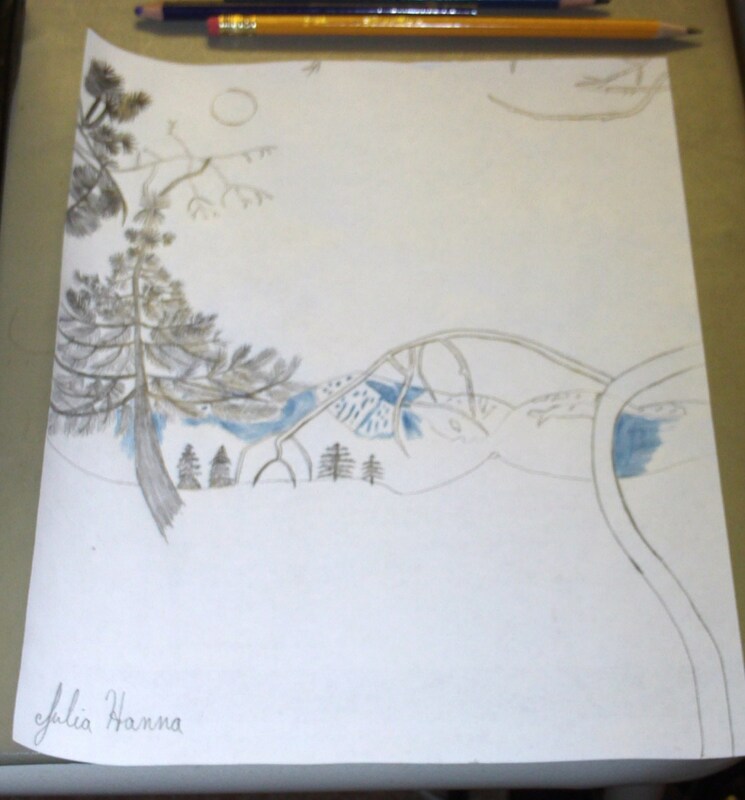 I am creating my piece of sunset art by shading in the silhouette of the pine trees and the mountains with a black colored pencil. Here I continue to add more of the black silhouette to my sketch. I continue shade in the silhouette of the mountains and the pine trees. The details on the pine trees in the distance were the most fun to create. 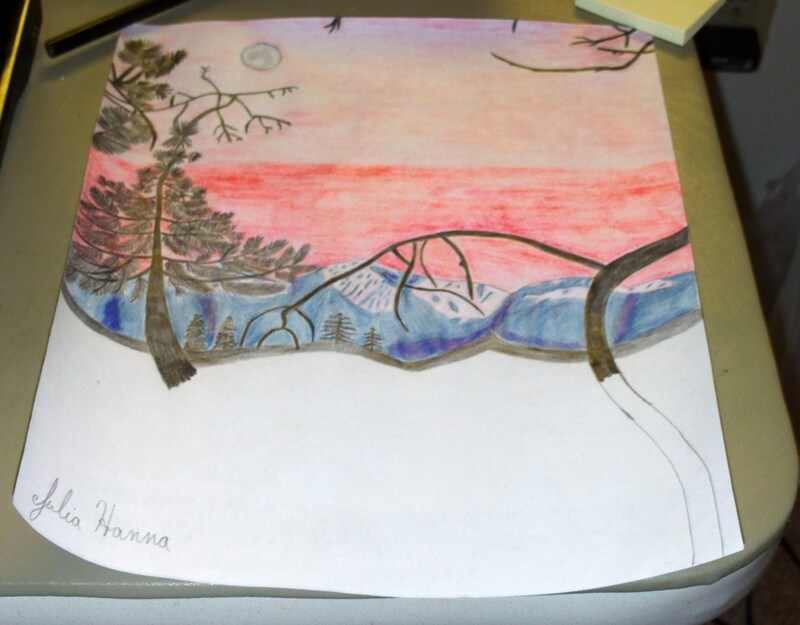 The black colored pencil is being used to created the shape of the mountains in this sunset scene. In this phase of the sketch I am using the black colored pencil to create the shape of the mountains in the sunset silhouette. Also, I am filling in the tree trunk in the foreground, which is beginning to take shape. I lightly shade in with black for portions I want to be lighter, and darkly shade in for the darker portions. Here is the completed sunset sketch. This is a scanned version of the sketch. 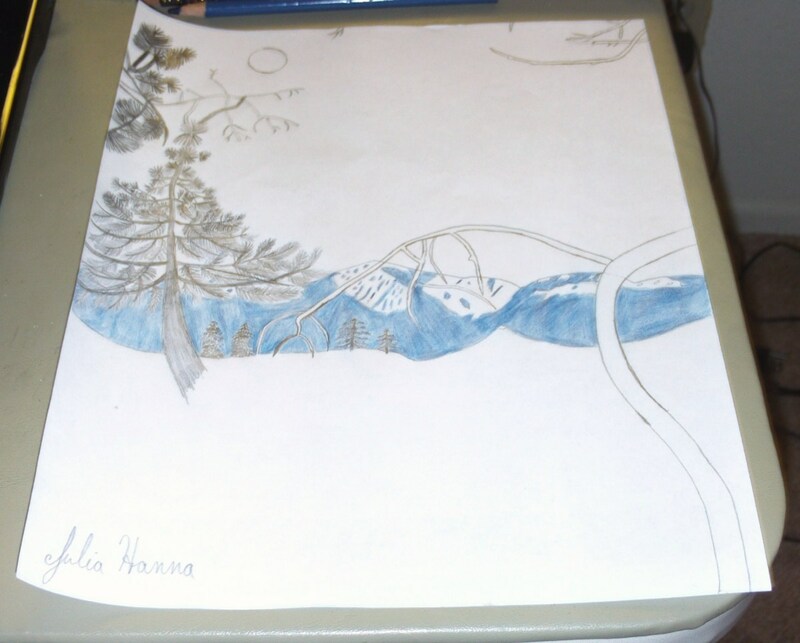 Using my colored pencil to create the shading for the mountains and the trees was quite soothing. When my sketch is completed, I am feel satisfaction and closure. Taking pictures of the drawing process helps me learn new things about my art work, and what I might do differently next time around. 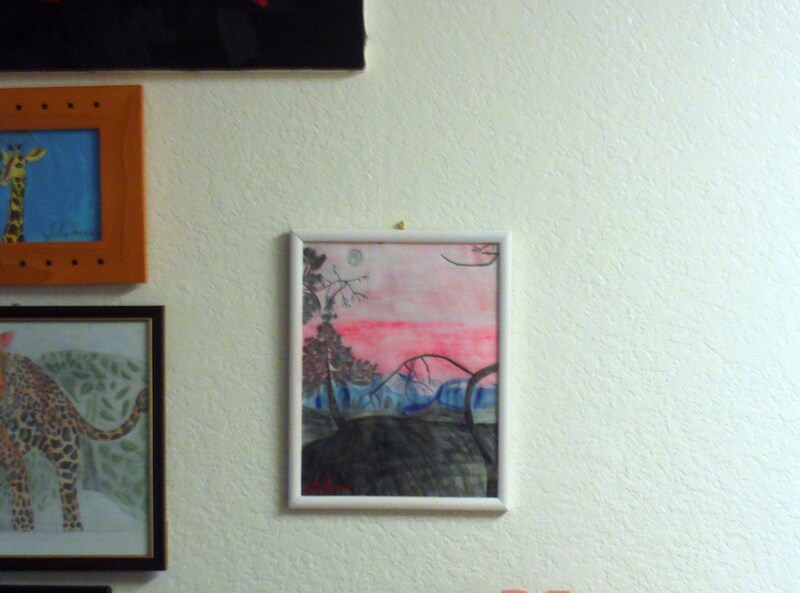 Here is my frame forest sunset sketch hanging on the wall. I purchased a simple white frame to hang my forest sunset sketch on the wall. As I create more art work over the years, I have learned that a cheap and creative way of decorating my home is to display my own work. So if you have a sketch that you are particularly fond of, just purchase a frame to hang it on the wall. Happy drawing! wow! 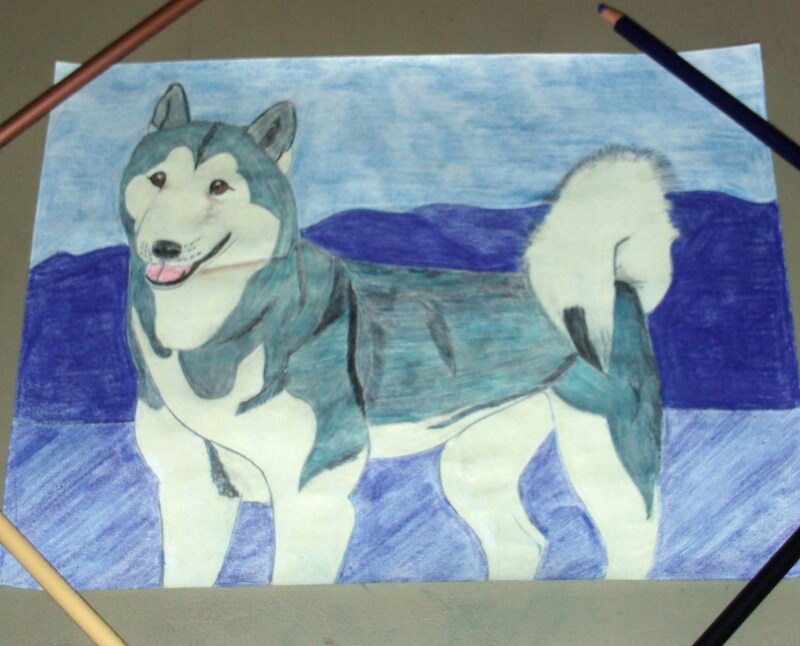 That is so amazing the way you drew the picture free hand. I guess a print out would make it a bit easier. Interesting on your choices of color pencils. And you definitely are gifted. A print out too makes sense to me, I would think the magnifying glass would bother the eyes at some point. Awesome! Shared...nice to meet you. Thanks, Peggy. I still post art inspired creations here from time to time, but if you want to see more of my up o date stuff, you can also check out my profile. On Twitter I post more of what I am creating at the moment. Thanks for sharing your artistic side with us in addition to your photography. You live in such a beautiful part of the country that images for inspiration should never be a problem for you. Creating art can be so much fun. 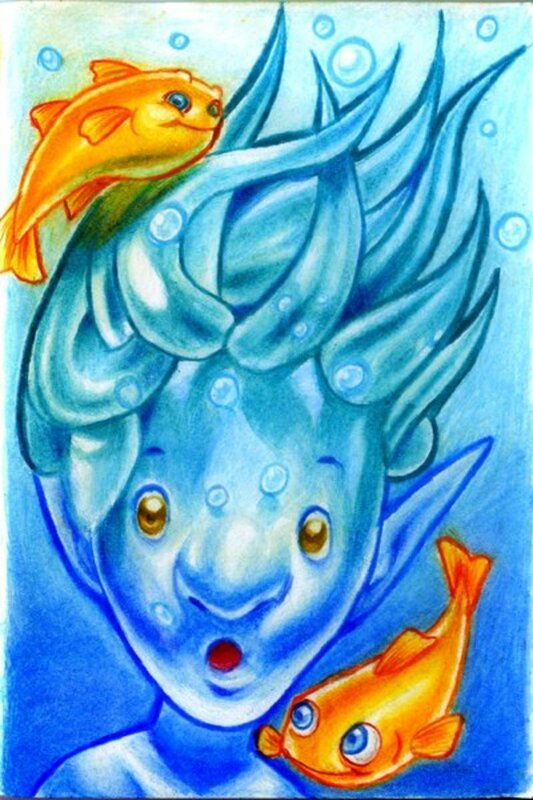 I started drawing when I was a child as a form of entertainment. Your walls are nicely decorated. Will be eager to see more! I have got to come back and work on this when I have time. Beautiful; will follow so I don't lose my place! You should definitely draw something. It is fun. This is real beautiful. I've always liked to draw. I might give this a try. Just drew these with a really sharp pencil. how did you draw the leaves? they are so tiny! Thanks, DDE. Always appreciate your encouragement. How To Draw A Forest Scene At Sunset so beautifully approached great talent in drawing. Well I have been in full bloom for years, but thanks for the lovely compliment. wow you are talented aren't you ? Great job and you are really a blooming artist for sure... GoodLuck !!! Cool and great tips SweetiePie. Beautiful picks that would make great drawings. Voted up, useful, beautiful, and shared. wow! this is so good.. i wish i could draw few. Thank you, Dolores! I especially enjoyed drawing this picture because it is based on one of my favorite locations to photograph: the view of Mount Baldy from the San Bernardino Mountains. Hi Sweetie - this is such a wonderful step by step tutorial. I love how you display the photos that you used, and every step of the drawing. This was a beautiful hub. I love the leaning evergreen. Your drawing is beautiful. 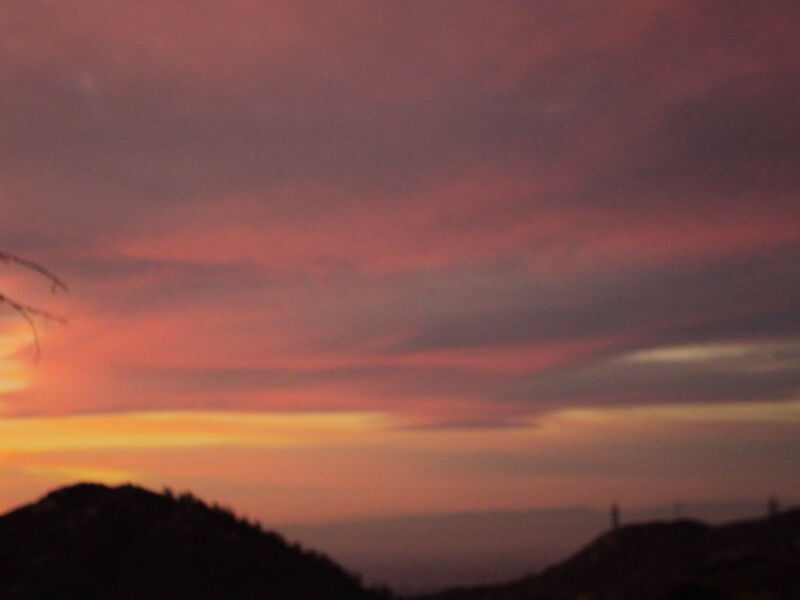 You captured the splendor of sunset over the mountains. Thank you for sharing and taking the time to teach others. Yes, it is true how every artist has their own way of expressing a particular subject. Forest scene at sunset is a great topic! And every artist has their own way of expressing it. That was fantastic. Thank you for a good lesson. Beautiful Hub! Pictures are simply amazing.. Thank you for your comments about my sketch. Looks good to me! Thanks, Sweetie. I think you took the inspiration from the photos quite well with the cool blue mountains and sun set colors. well done!